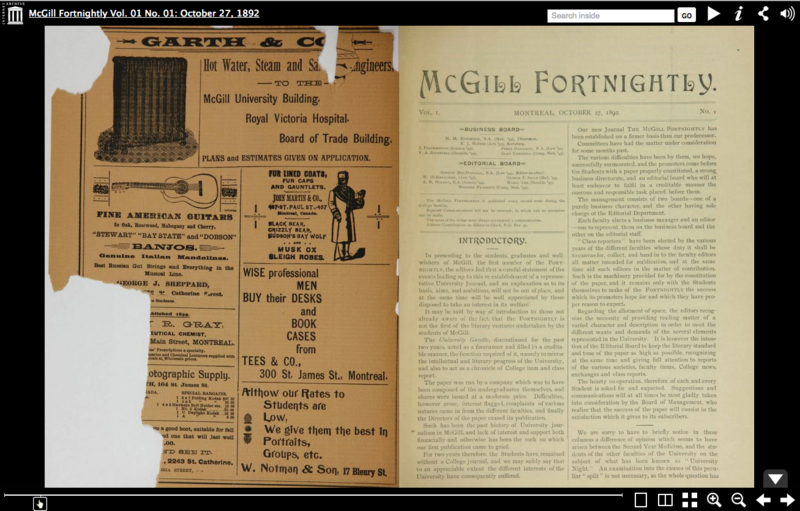 The McGill Fortnightly, ‘A Fortnightly Journal of Literature, University Thought and Events.”–V. 1, no. 3., was bi-monthly published by students between 1892-1898 and the indirect successor to the McGill University Gazette. 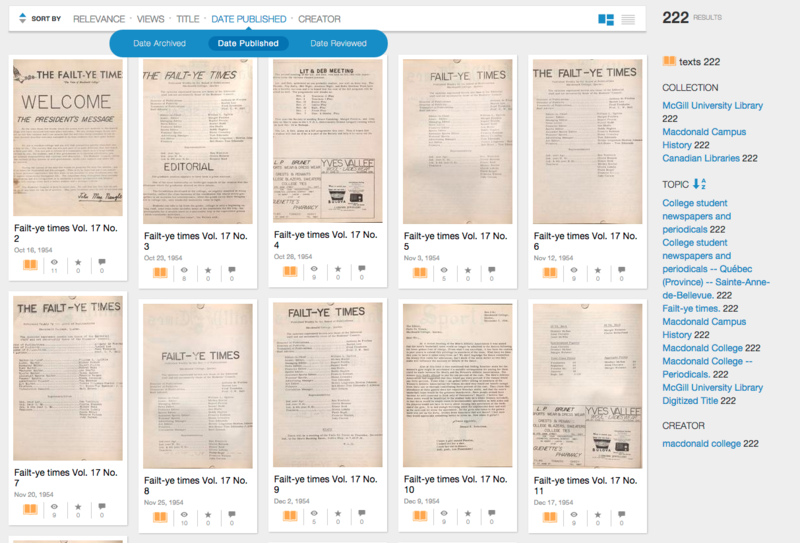 We digitized all 46 issues including the covers and advertisements in the McGill University Archives but there are gaps in the collection covering the later years. 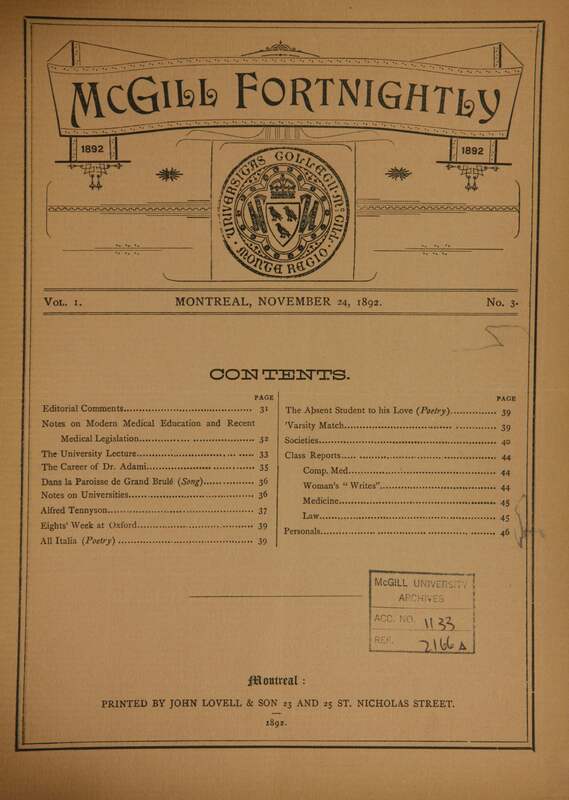 These issues are a part of our larger McGill Student Publication collection. 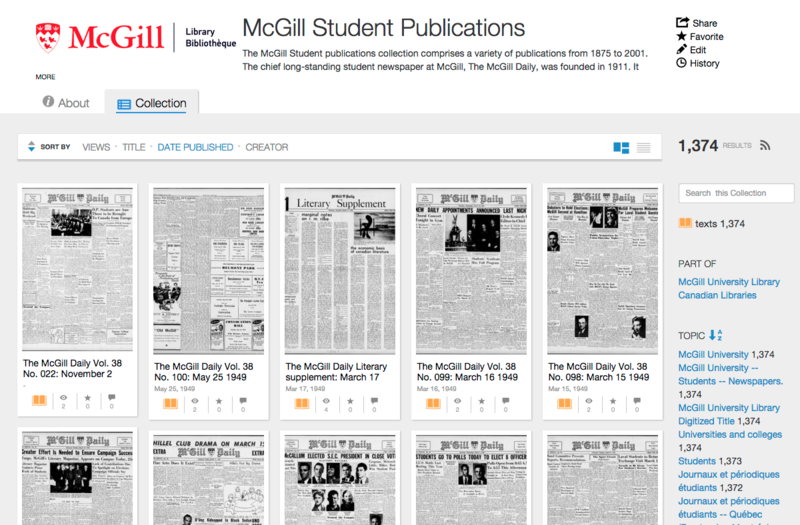 Last winter we were able to digitize over 50 rolls of microfilm containing over 9,000 issues of the McGill Daily. 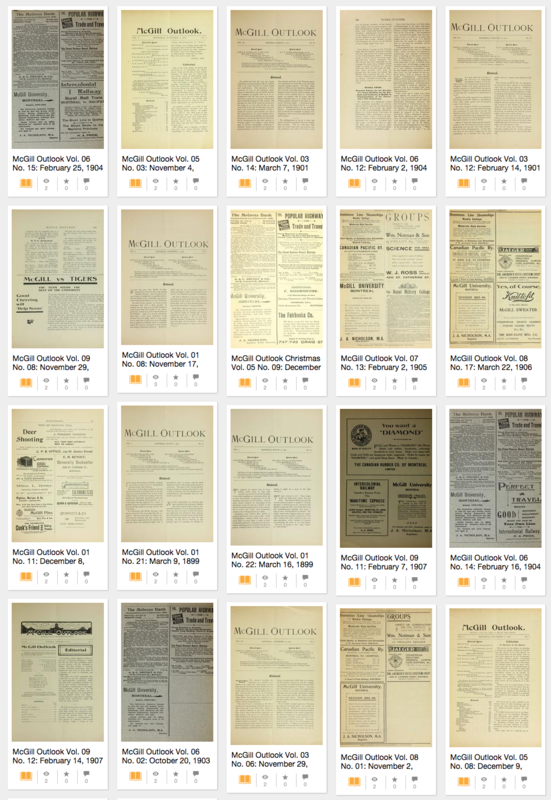 Starting with their very first issue from October 2nd, 1911 we are going to be spending the summer uploading just over 9,000 issues dating to 2001 to our new Internet Archive collection of McGill Student Publications. Check back often during the summer as we’ll be uploading a few hundred issues each day. The McGill Daily Vol. 01 No. 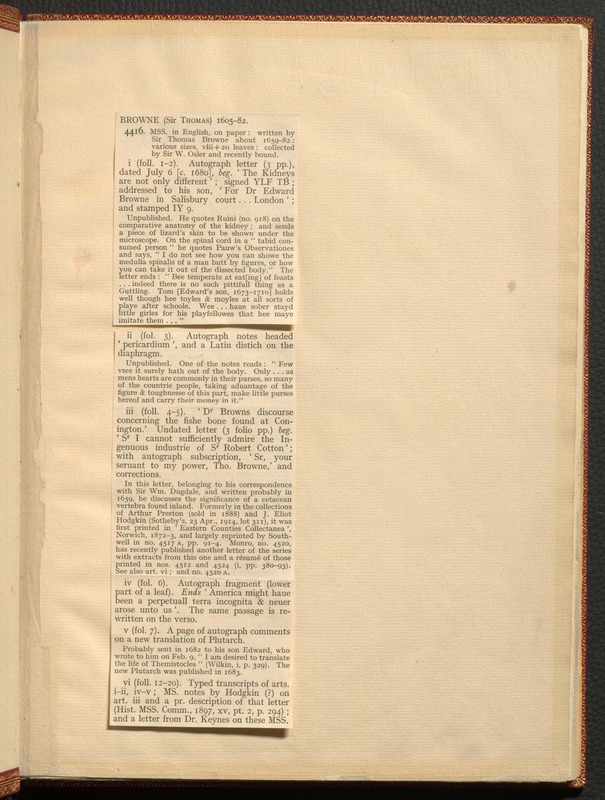 001: October 2, 1911 was a little worse for wear when it was microfilmed but it is still searchable. 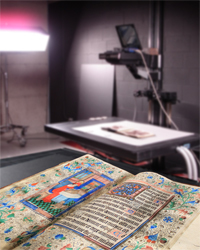 This project is part of larger project to showcase the unique material that has been published by McGill students. 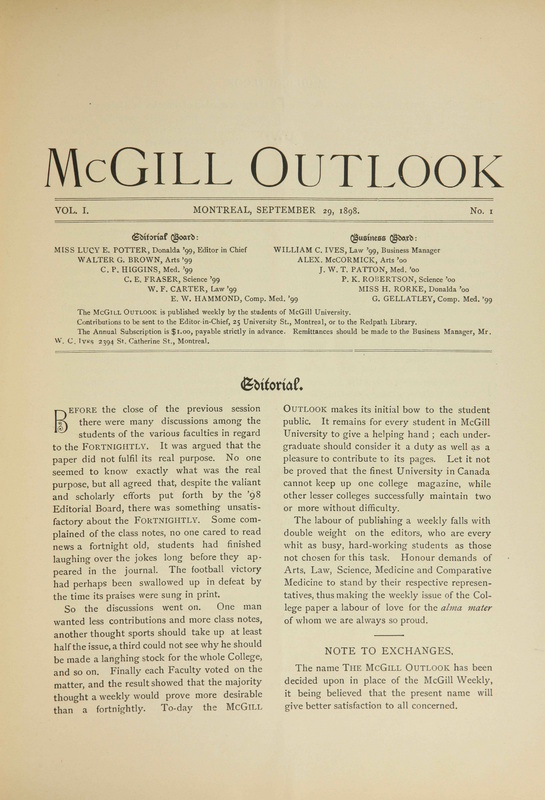 When we have finished all of the issues of the McGill Daily we’ll start uploading the predecessors publications that date back to 1873 from our archives including McGill (University) Gazette (1873-1890), the McGill Fortnightly (1892-1898), the McGill Outlook (1898-1907) and the (McGill) Martlet (1908-1911). 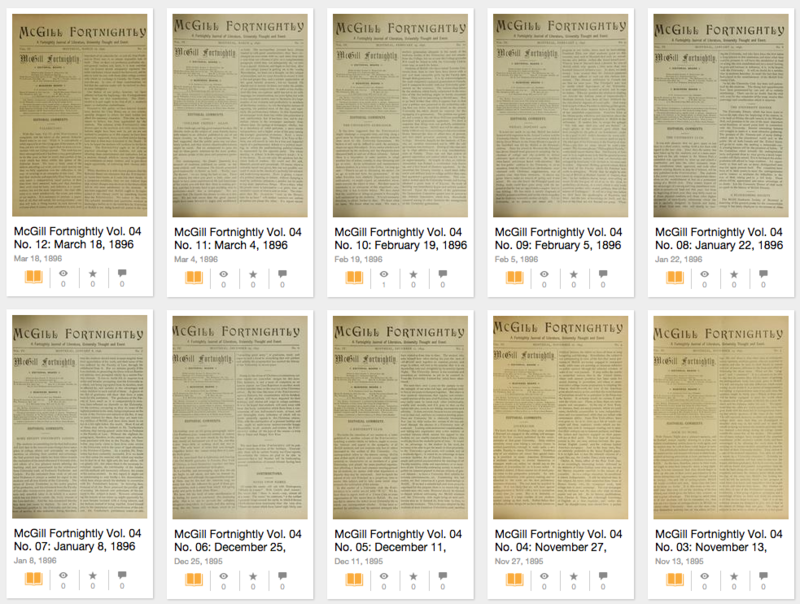 We also plan on adding the already digitized McGilliad (1930-1931) and the McGill Fortnightly Review (1925-1926). 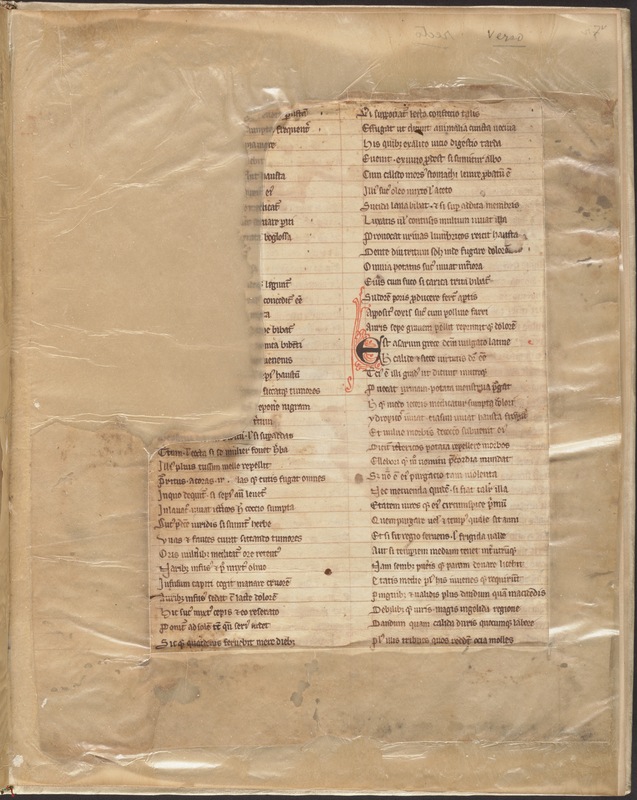 Various sizes of letters and notes bound together. 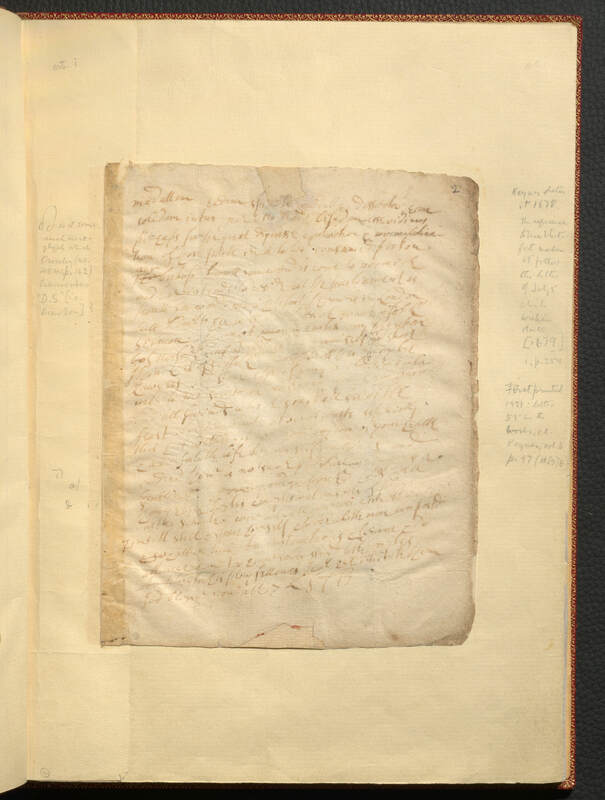 Written by Sir Thomas Browne and collected by Sir W. Osler. You can download all of the letters and notes from our catalogue or you can see the originals by visiting the Olser Library of the History of Medicine during opening hours. 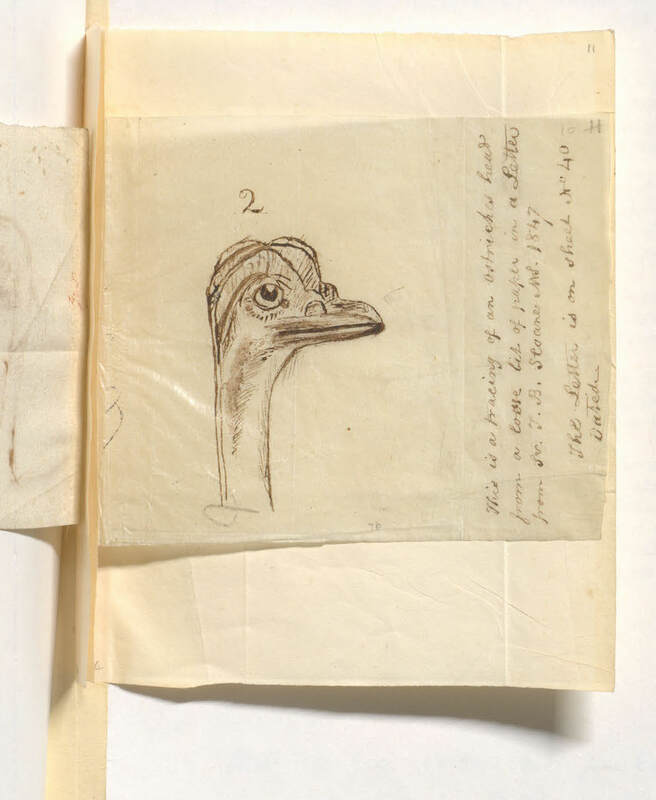 Page 43 “Ostrich’s head within”. New to our digital catalogue via an Interlibrary loan request: Poster announcing schedule of celebrations planned to celebrate the diamond jubilee of Confederation, in Richmond, Québec. Poster has type set so that words which are identical in English and French appear only once, printed in the middle of the sheet, e.g. Confederation, Richmond; the English text can be read down the left side of the sheet, the French text down the right side. Dates 1867 and 1927 not printed next to each other, but one on each side of “Confederation”. Richmond County Citizens’ Association (Québec). (1927). 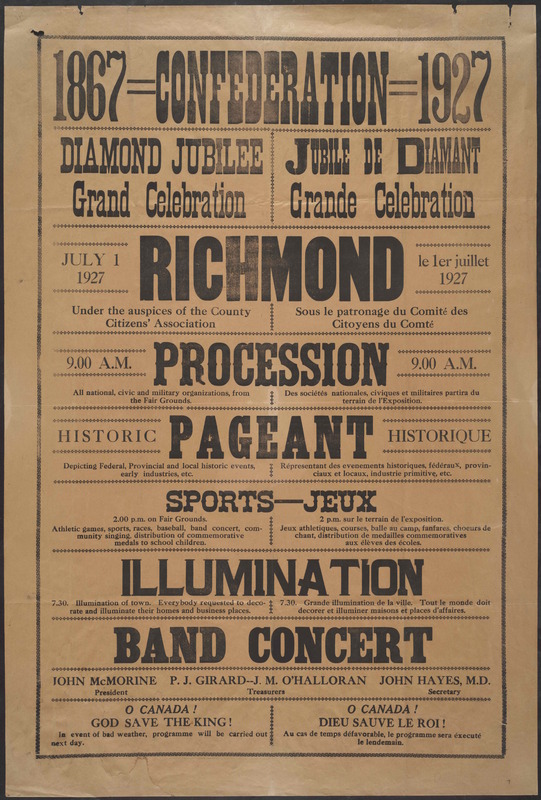 Confederation, 1867-1927: Diamond jubilee grand celebration, July 1st, 1927, Richmond, under the auspices of the County Citizens’ Association. 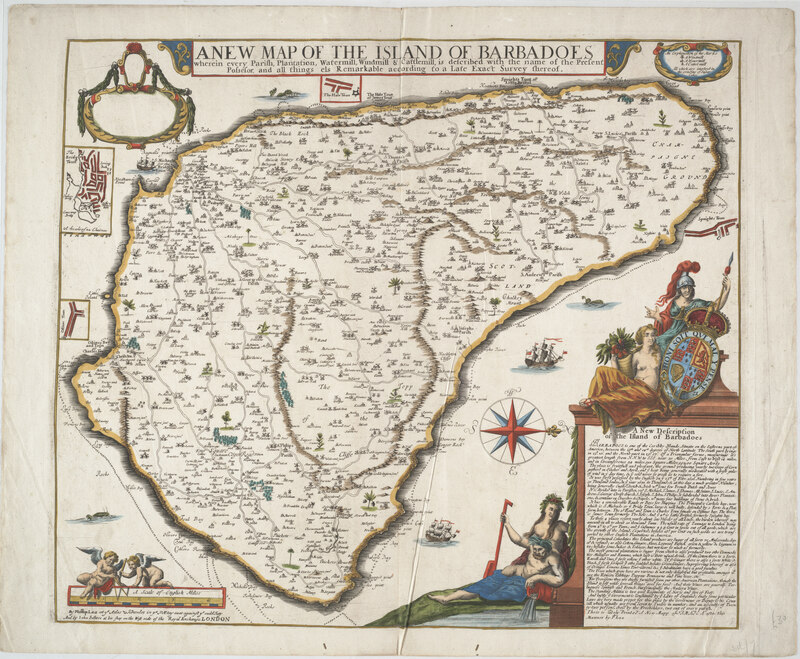 You can download the poster our catalogue or you can see the original by visiting the Rare Book and Special Collections reading room during opening hours. 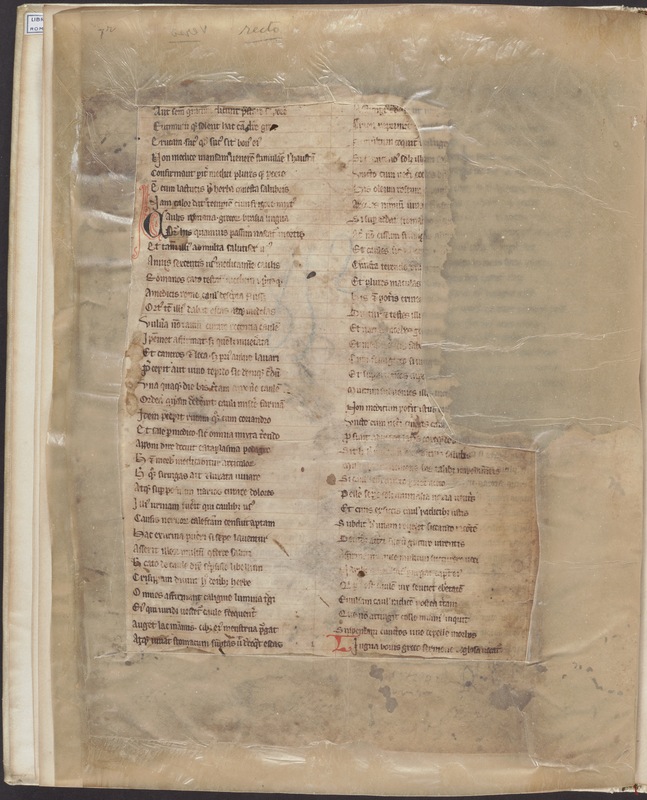 New to our digital catalogue: Macer Floridus : a section of the medieval herbal, on 2 damaged leaves] came to us from the Olser Library of the History of Medicine by way of a researcher request. The cataloguing notes tell us the herbal has been attributed erroneously to Macer Floridus. 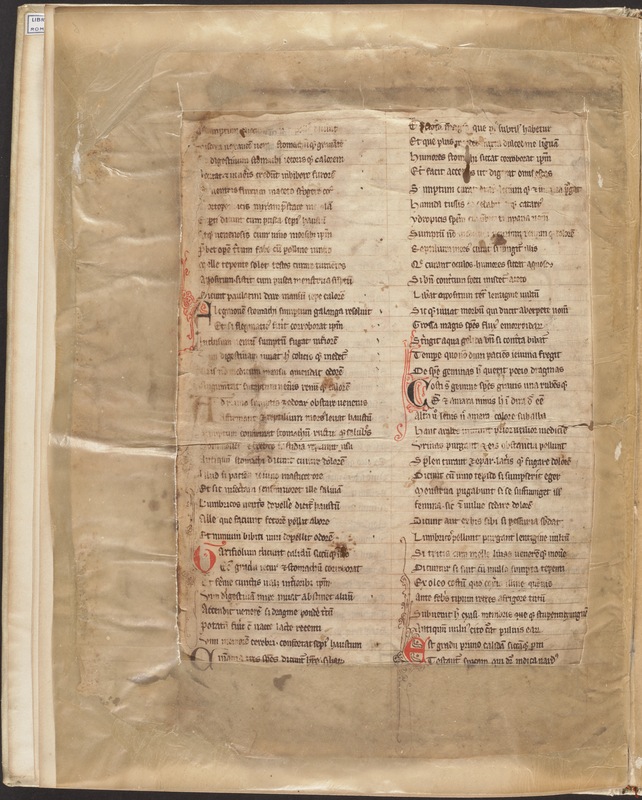 In double columns, containing 288 hexameter lines, which correspond to chapters 65-73, Piper-Costus and to chapters 36, Caulis, 34, Bugloss, 38, Origanum, 46, Asarum, in Pictorius’s ed. : Basel, 1559. Except for 2 leaves (shown below), the vol. 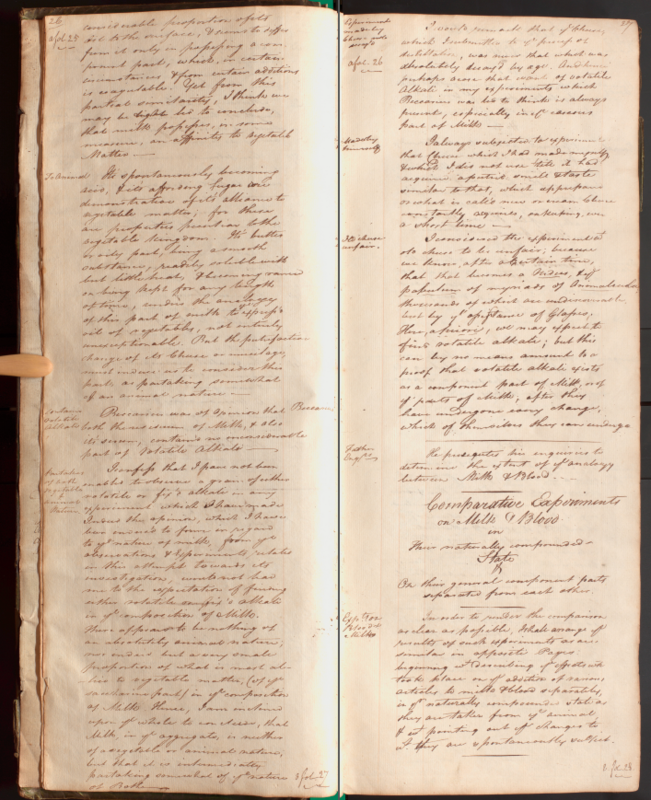 is of blank paper which we left in the PDF; with coloured capitals. Macer, . (1300). 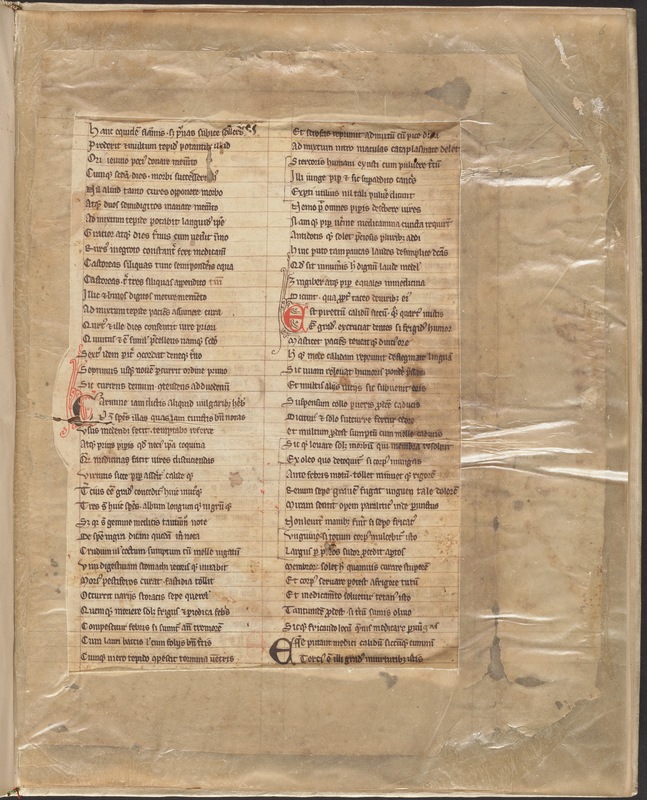 Macer Floridus: [a section of the medieval herbal, on 2 damaged leaves]. 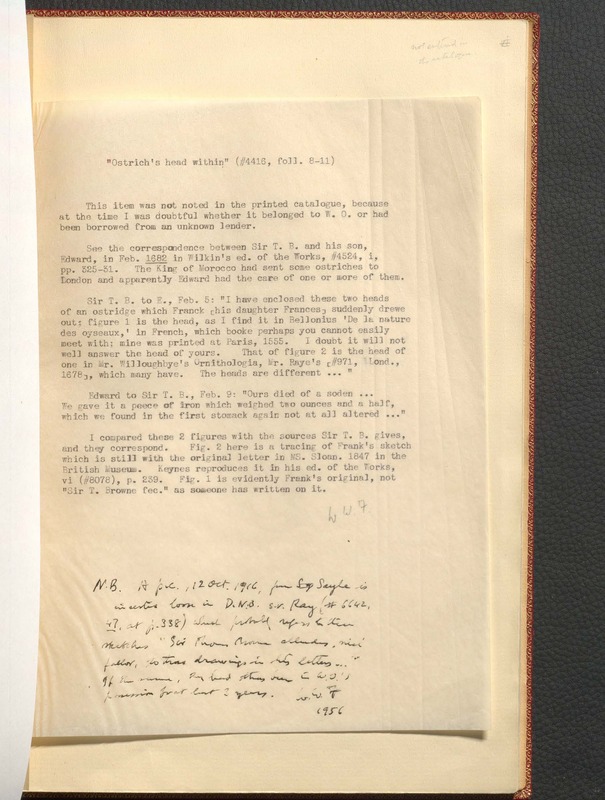 You can download the PDF of the manuscript from our catalouge or come see the real thing by visiting the Osler Library of the History of Medicine. 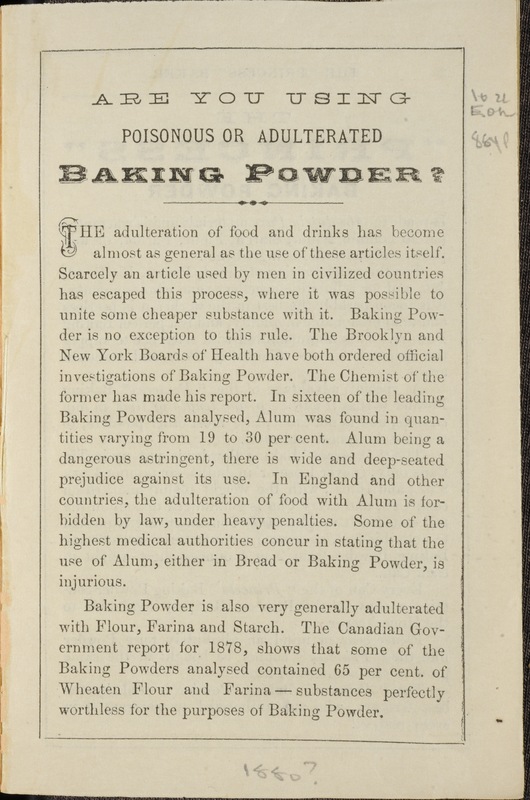 A baking powder fraud exposed from 1879! 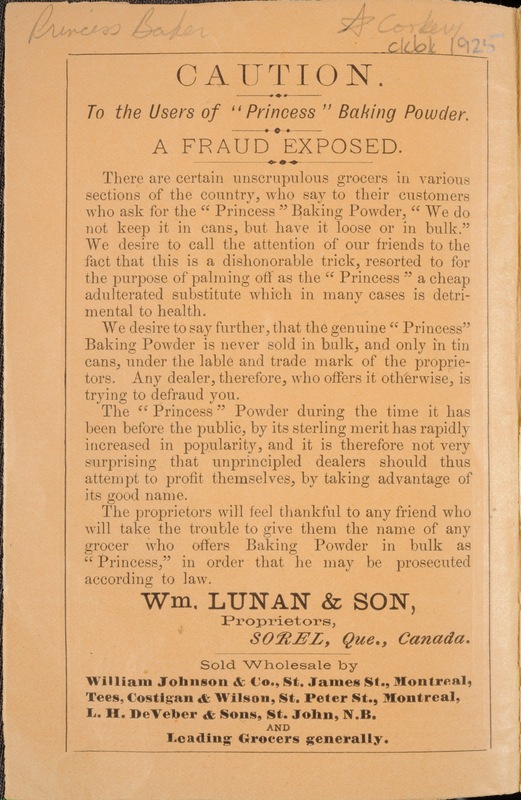 New to our digital catalogue: Found inside the ‘The princess baker’ by William Lunan & Son (1879) in our Cookbook Collection, Rare Books and Special collections. Inside cover. William Lunan & Son. (1879). The princess baker. Page 2. William Lunan & Son. (1879). The princess baker. To read the whole 16 page booklet and find some great recipes you can download it from our catalogue or you can see the original by visiting our Rare Book and Special Collections reading room during opening hours.